Wow, it has been a while, but I am back with a Barnyard Tablescape! Which of course got my wheels turning. I knew I wanted to incorporate my burlap napkins and chargers and just went through by dishes to see what would work the best with the napkin print. I also knew I had some little bales of hay somewhere in my stash of fall stuff, and while I was looking for that I came across a bundle of wheat that worked out great for my centerpiece. I am in love with these little dairy jars. I had been eying them in Michaels since they first came in, now I had a coupon in hand and a good reason for the purchase! added some various barn yard animals! and when you have chickens . . . .
you have to have chicken wire napkin rings! 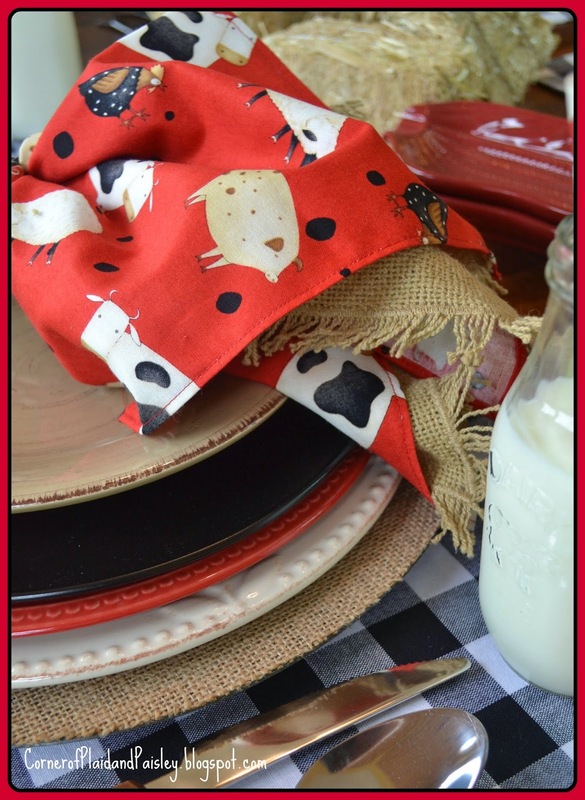 The black and white buffalo check place mats just seemed to ground it all! OK! I have to ask - How many of you "Moo" when you drive by a cow? I just have to!! I can't help my self! Thanks for stopping by the Barnyard! What a fun table! I like the black and white with all the red details. Must find myself some buffalo check in black and white. Love the napkin fabric too! 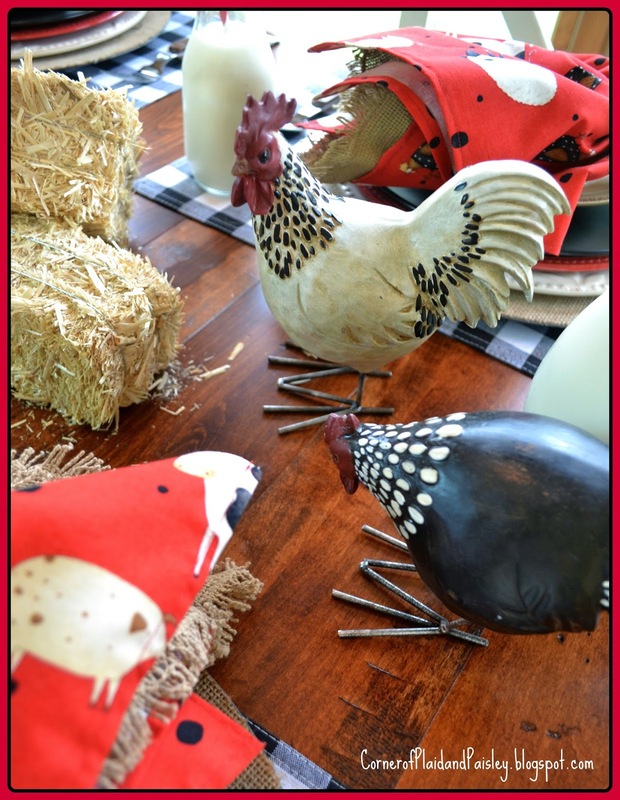 I love the barnyard tablescape with all of the fun colors.....but the chickens are my favorite! As always, your table is not only fun, but beautiful. Thanks for the inspiration! 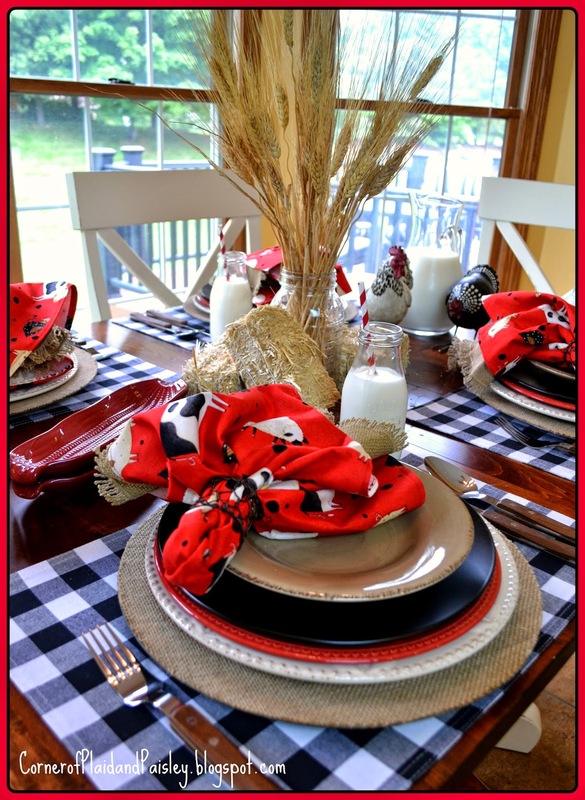 Ann, love the tablescape...anything to do with chickens/roosters instantly catches my eye. 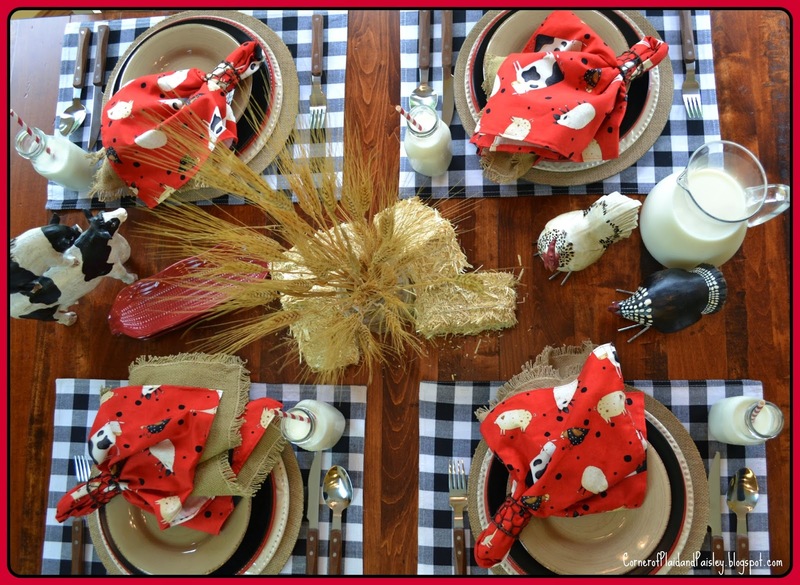 The buffalo checked placemats and red napkins are so perfect for this table! I would be so happy to find napkin rings made with chicken wire. The little milk jugs remind me of many years ago in grade school before they went to disposable cartons. Love your tablescape. Yes I admit I moo when I see cows too. My husband grew up on a dairy farm, so of course we moo! Your table is absolutely charming! What a fun tablescape. 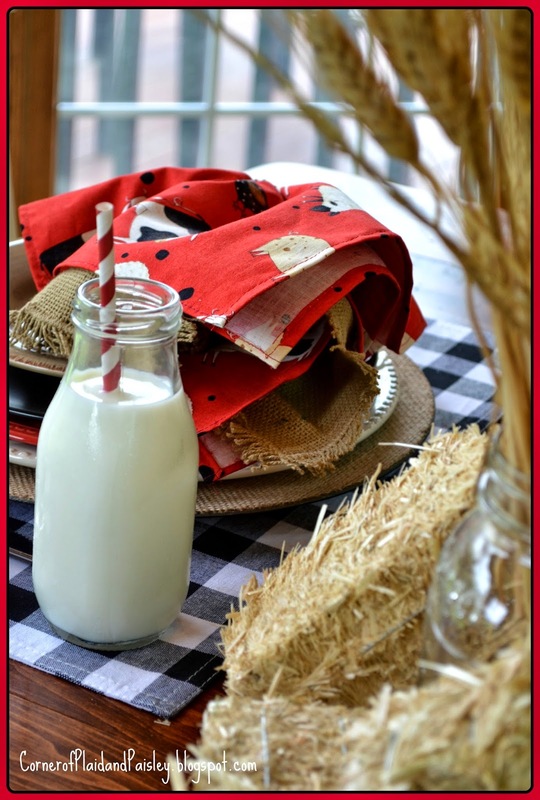 Love the black, white and red and the buffalo check place mats and the cute milk/cream bottles with a straw. 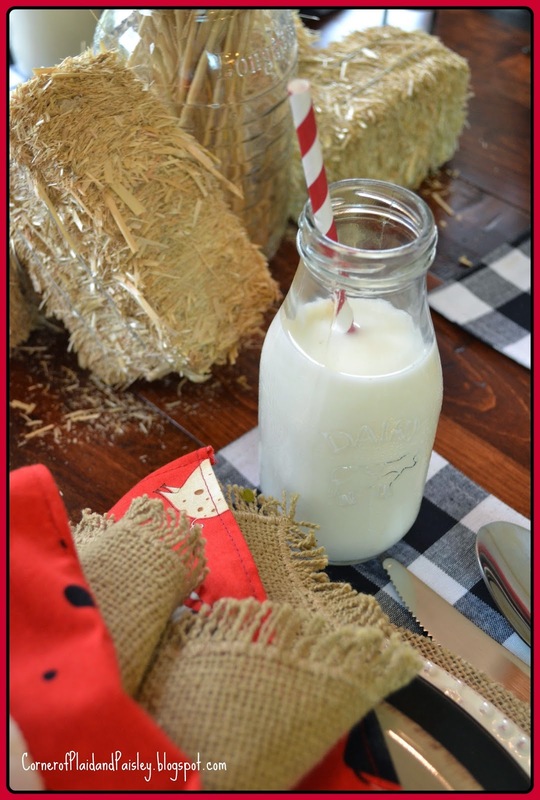 Love your tablescape...and love collecting little dairy bottles too....the fabric is so pretty and perfect for your farmhouse table..the chicken wire napkin ring is the cutest!! Oh my! We mooed in Maine when we saw moose signs because we never saw any moose! They told us we would see so many! lol That is too funny. I love your table! Your napkins are divine! This is just so darn cute! Love the little bottles, that I now will have to go buy some! I want to drink milk out of them! Cute for kids too! Your chicken napkin ring is clever! Thanks for sharing. This table made me so happy! That is so adorable! 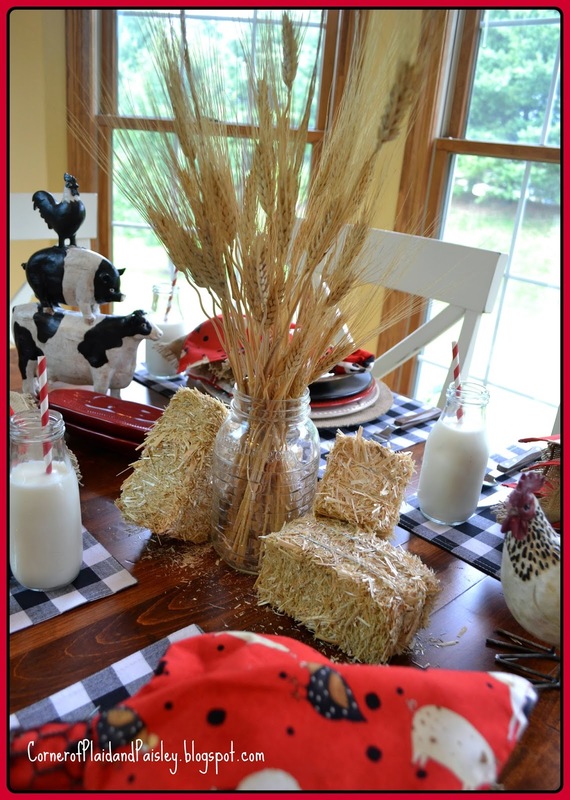 The hay and those gorgeous napkins....Love this tablescape! This is such a fun table, I love all of the farm details. The napkins are adorable!! Love the rustic charm that's going on! OK...a little weird that YOU moo, but I'll just chalk it up to your love of nature??? That just made me laugh!!! I LOVE THIS TABLESCAPE!!!!!!! You did a fabulous job here, Ann! It's great for the transition from summer into fall, and the barnyard nature of it is just so cool! I really like the combination of fabrics. 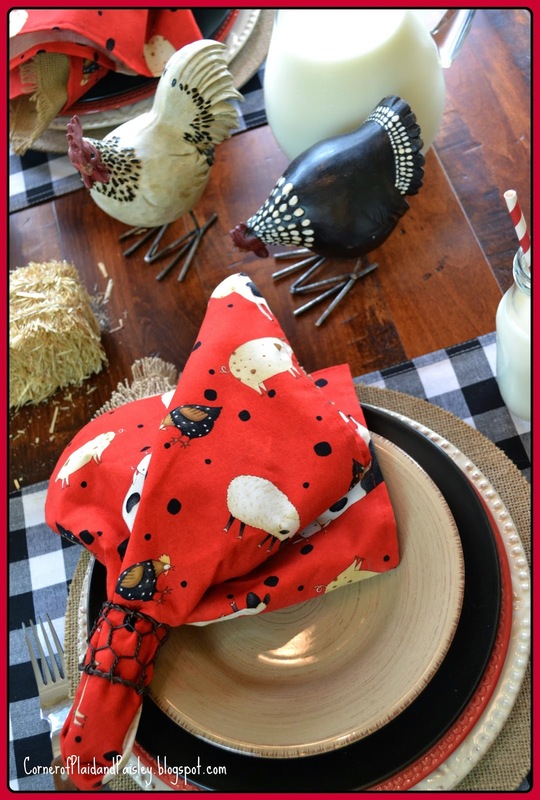 The buffalo check is perfect with the fabric found in Amish country! The chicken wire napkin rings are right on time! Perfect!!! I can't even begin to tell you how much I love this one. It is so much up my alley. I love the creative and whimsical tables better than any other type. (And since I pretty much love every type, that's saying something.) My favorite thing about this one is the way the burlap looks inside the print napkins. It's perfect with all the other farm yard touches. I'm late getting around to visiting tables this week. My daughter had oral surgery at the end of the week, and I've been very distracted being nursemaid to a chipmunk. So glad I got a chance this morning to visit the tables and see this. Love it! OK, I'm back with this: I have been browsing your old posts and discovered that I need to follow you so I can see what you have up your sleeve next. I love your style!! This is MOOvelous !!!!!!!!!!! 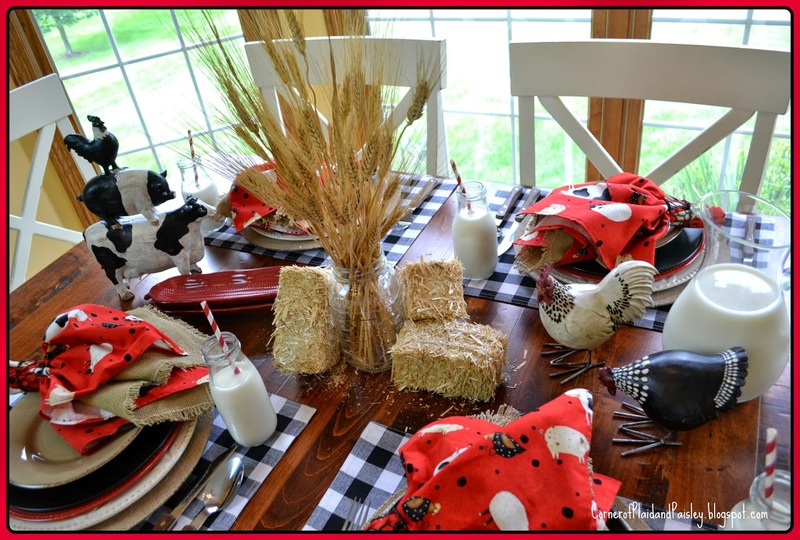 what a fun table and although I am allergic to hay I would still love to sit at that table ACHOO!!!!!! I LOVE this table Ann! The fabric is awesome, I wish I had some, what great napkins!!! and the chicken wire napkin rings!! The bold checks, hay and wheat is all so great and perfect for the "farm". 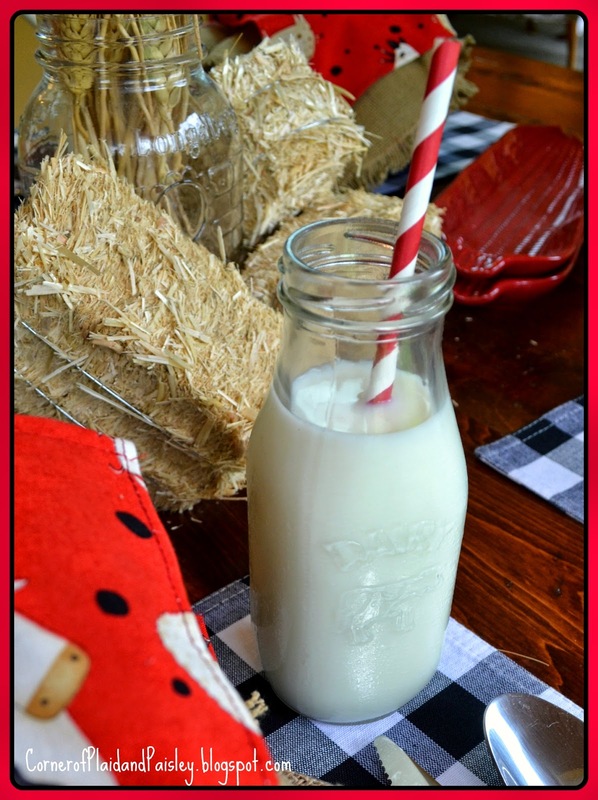 The pitcher of milk and milk bottles, it's all GREAT! Of course I moo.... We are sisters!! !